country in November 2010 isn’t repeated in 2012.
only needed a bit of “tweaking,” he insisted. pored over the election results and reached an inescapable conclusion. as little as possible about Obamacare. 1. Stop talking about it. bills passed by the next Congress. 2. Focus on the small stuff. about small changes, they will wonder what all the fuss was about. and forcing seniors to pay thousands of dollars more for health care. the new law is hurting them. stop granting new ones as of September 22, 2011.
far, it seems to be working. Obamacare has evaporated as a major issue. employers and employees, doctors and patients). by the Supreme Court. That is a big gamble. hearing next year and a decision by June 2012. Supremes will likely look at public opinion in weighing their decision. thing and let the legislation stand. verdict could depend upon its strategy of silence. will have a shocking awakening in 2014? most expensive items in their family budget. to federal mandates, fines, and even higher health costs. ?when businesses have to find out their employees’ household income so they can avoid $3,000 per-employee annual fines. costs are crushing their budgets. ?when hospital emergency rooms are still flooded with patients but funds for this “uncompensated care” are vanishing. ?when tens of millions more line up for subsidized health insurance, adding $1 trillion or more to the cost of the law. poured into an unreformed health care system. 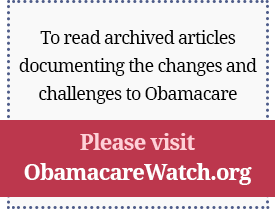 restructuring” of job-based health coverage. another $480 billion out of the program to lower the deficit. private coverage much like the plan members of Congress have today. provider. This will inevitably lead to government rationing of care. Romney signed into law, as the model for his own plan. Act. Waivers are not a solution. FOR NOW, expect the administration to continue to play down Obamacare’s changes and show flexibility at every turn. cutting Medicare payments to meet strict targets. statement, she took the offense to criticize the Ryan Medicare plan. or distract the public by demonizing Paul Ryan and his Medicare plan. listen. Now the White House hopes we will forget. our future prosperity could not be greater. Published in The American Spectator, September 2011. The White House is quietly implementing a shrewd new strategy of silence on Obamacare. Its goal: making sure the revolt against the unpopular health care overhaul that swept Republicans into power across the country in November 2010 isn’t repeated in 2012. After two years of nonstop focus on health care, the president has stopped talking about the law’s far-reaching effects. Now he is concentrating on a few micro changes. Meanwhile the administration is working hard to dampen controversy by handing out buckets of waivers and attacking Republicans over Medicare. Bringing Obama around to this new course wasn’t easy for his advisors. The day after last November’s elections, the president belligerently refused to acknowledge that the results were a referendum on his unpopular policies or that Obamacare had hurt Democratic candidates. His health policy agenda was correct and possibly only needed a bit of “tweaking,” he insisted. But his advisers pored over the election results and reached an inescapable conclusion. “The economy, as important as it was, was not the decisive factor this election. Health care was,” Democratic pollster Pat Caddell said just after the election. “It is…health care [that] killed them,” Caddell said of the 63 defeated House Democrats. “The American people found this a crime against democracy…they want it repealed, and this issue is gonna go on and on.” Now the White House’s strategy has the president talking as little as possible about Obamacare. 1. Stop talking about it. Every time you talk about the sweeping overhaul of health care, your poll numbers go down. People know you can’t spend $1 trillion and pretend to reduce the deficit. Or take more than $575 billion out of Medicare and make it stronger. Anyway, it is now the law of the land and the wheels of bureaucracy are grinding to make sure it takes effect in 2014. Your only job right now is to get reelected to veto any reform bills passed by the next Congress. 2. Focus on the small stuff. People don’t know what is in this law, as Republicans so annoyingly continue to remind us with Nancy Pelosi’s unfortunate quote — “We have to pass the bill so you can find out what’s in it.” We can calm the opposition if the public is convinced that it’s only about putting 26-year-olds on their parents’ health insurance, free preventive care, risk pools for preexisting conditions, and some new insurance regulations. We should call attention to those who have already benefited from the law’s early provisions. If people believe it is only about small changes, they will wonder what all the fuss was about. 3. Attack Republicans. Health care is a Democratic issue and always will be. So go after Republicans for their ridiculous ideas about “private competition” and “putting consumers in charge of decisions.” Paul Ryan has given you a golden opportunity to target Republicans for trying to destroy Medicare and forcing seniors to pay thousands of dollars more for health care. Hammer away at him. 4. Calm the opposition. The most important thing is to keep opponents quiet. Health Secretary Kathleen Sebelius is a key ally here since the health law gives her so much power over how it is implemented. Focus on the governors. Sebelius should find ways to give them temporary relief from Medicaid costs. She also should issue waivers to states, companies, and anyone else who complains the new law is hurting them. THE NEW OBAMACARE strategy is working smoothly except for tactic number 4. The waiver tactic backfired, as it became clear that waivers from the law’s early provisions were needed and were being granted disproportionately to politically favored groups (restaurants and spas in San Francisco and hundreds of labor unions, for example). To calm the negative press, the administration now says waivers will be good through 2013, and it will stop granting new ones as of September 22, 2011. So far, it seems to be working. Obamacare has evaporated as a major issue. The House of Representatives voted overwhelmingly to repeal the law in January and, according to a CBS News poll, about half of those asked think it has been repealed or aren’t sure. The confusion suits the White House just fine. Republicans are working to defund the law, delay its implementation, investigate the avalanche of regulations that have already been issued, and examine the impact the law is having on health costs and the ballooning deficit, but their efforts didn’t make the front page. It is difficult to overestimate the sweeping impact that Obamacare will have on our health sector, our economy, and our freedom. (My co-authors and I have highlighted in our book Why ObamaCare Is Wrong for America [Broadside/HarperCollins, 2011] the devastating impact it will have on seniors, families, young people, taxpayers, employers and employees, doctors and patients). WILL THE SUPREMES rescue us? While many hope Congress will repeal the law, others believe there is a good chance its key provision–that all citizens purchase federally approved health insurance–will be declared unconstitutional by the Supreme Court. That is a big gamble. The Sixth Circuit was the first of several appeals courts to rule on the validity of Obamacare’s mandate; conservatives were disappointed about its decision in late June to uphold it. At least two other appeals courts will issue decisions over the next several months, with a likely U.S. Supreme Court hearing next year and a decision by June 2012. Scholars expect a 5–4 decision, with Justice Anthony Kennedy the deciding vote. Courts are reluctant to overturn major legislation enacted by Congress. The Supremes will likely look at public opinion in weighing their decision. If the law is still unpopular, it will be much easier for them to decide (correctly) that the individual mandate is unconstitutional. But if the country seems to have settled into acceptance, they could do the easy thing and let the legislation stand. That’s yet another reason the White House is doing everything it can to calm opposition and convince the public that the law is beneficial. The Supreme Court verdict could depend upon its strategy of silence. …when they are facing a mandate to purchase health insurance policies that will be one of the most expensive items in their family budget. …when job creation continues to stall because employers are reluctant to hire workers due to federal mandates, fines, and even higher health costs. …when businesses have to find out their employees’ household income so they can avoid $3,000 per-employee annual fines. …when states find that adequately funding schools, roads, and police protection is almost impossible because dramatically expanded Medicaid costs are crushing their budgets. …when hospital emergency rooms are still flooded with patients but funds for this “uncompensated care” are vanishing. …when tens of millions more line up for subsidized health insurance, adding $1 trillion or more to the cost of the law. …and taxpayers realize that estimates of the cost of Obamacare were dramatically understated, with more and more deficit-financed dollars poured into an unreformed health care system. In the face of this tsunami of change, it’s crucial to direct the conversation back to the health care law’s defects. There are two hot-button issues that will surely force Obamacare back into the center of the political debate: employment-based health insurance and Medicare–both of which affect two huge constituencies with health coverage that is threatened by Obamacare. Start with employer-based health insurance. The White House knew that providing security to those with coverage was a key selling point for passing legislation designed to provide insurance to an estimated 32 million more Americans. Hence the mantra: “If you like your health insurance, you can keep your health insurance.” But a recent survey of employers conducted by the consulting group McKinsey & Company found that up to 50 percent say they will definitely or probably pursue alternatives to their current health insurance plan after Obamacare takes effect in 2014. That means as many as 78 million Americans could be forced to find other sources of coverage–half of the 156 million working Americans who get health insurance through employers. This also has huge implications for the deficit. This new entitlement program will exacerbate the extraordinarily difficult task of controlling federal spending. Before the health law passed, the Congressional Budget Office estimated that only 9 million to 10 million people, or about 7 percent of employees who currently get health insurance at work, would switch to government-subsidized insurance. But the McKinsey survey of 1,300 employers across industries, geographies, and employer sizes found “that reform will provoke a much greater response.” It concludes that the new law will lead to a “radical restructuring” of job-based health coverage. to change coverage categories in the two years” after the insurance mandates take effect in 2014. Many employees who will need to seek another source of coverage will take advantage of the health insurance subsidies for families making as much as $89,000 a year included in the health care law. This will drive up the cost of Obamacare by $1 trillion or more, according to Douglas Holtz-Eakin, a former director of the Congressional Budget Office. The other unpopular aspect of Obamacare is its treatment of Medicare, which is being used as a budgetary piggy bank by Democrats. They count on using $575 billion in future payment cuts to finance creation of the two massive new entitlement programs in Obamacare. And the president has proposed taking another $480 billion out of the program to lower the deficit. Under Obamacare, payments to providers would be cut so deeply that seniors will find it harder and harder to get care. Doctors would stop taking Medicare or go bankrupt, according to Medicare actuaries. A whopping 87 percent of doctors say they will stop seeing or will restrict the number of Medicare patients they see, further limiting access to care. Seniors also fear the powerful, 15-member Independent Payment Advisory Board (IPAB) that will use price controls to meet ever-elusive spending targets. Rationing is inevitable, especially of newer medicines and technologies. But that is indeed the president’s strategy. He repeatedly hammers House Budget chairman Paul Ryan for his plan to begin modernizing the program starting in 10 years. Ryan wants to give baby boomers the option of private coverage much like the plan members of Congress have today. Access to coverage would be guaranteed, and payments would be tailored to meet a person’s age, health, and income level. Meanwhile, the president’s plan would tighten the tourniquet on Medicare with price controls that will make it more and more difficult for seniors to find a provider. This will inevitably lead to government rationing of care. SO HOW is this issue going to play in the 2012 elections? There is legitimate concern about former Massachusetts governor Mitt Romney as the Republican nominee. The president appears to relish opportunities to remind people that he used Romneycare, the state health care program Romney signed into law, as the model for his own plan. His plan is an easy target for Democrats. Both Romneycare and Obamacare require residents to have health insurance or pay a penalty. Both force most businesses to participate or pay a fine. Both expand coverage through Medicaid and government-controlled insurance exchanges. Both subsidize highly prescriptive (and costly) insurance policies. And both require an expanded government bureaucracy to manage the whole Rube Goldberg contraption. While Romney insists Obamacare must be repealed, it will be very difficult for him to put much daylight between his plan and the president’s. Romney still is trying to defend his position that his plan was right for Massachusetts, but that he wouldn’t impose it on the rest of the country. But Gov. Romney must know he can’t use an executive order to wipe out two massive new entitlement programs, $550 billion in new and higher taxes, vast Medicaid expansion, and mandates on individuals, businesses, and the states to comply with the Patient Protection and Affordable Care Act. Waivers are not a solution. Second, he says: “Of course, the ultimate goal is to repeal Obamacare and replace it with free-market reforms that promote competition and lower health care costs. But since an outright repeal would take time, an executive order is the first step in returning power to the states.” Take time? The Republican House passed a repeal bill within a few weeks of taking power. If there were a majority in the Senate supporting repeal, they could repeal virtually all of its massive spending provisions with 51 votes, using the reconciliation process that allowed Obamacare to pass. Then a new president could have a bill to sign on his desk within a month or two of taking office. For instance, there is the substantive concession that the president has made by quietly repealing the burdensome 1099 provision that would have required small businesses to track and report all transactions with vendors totaling $600 in a year. And last spring, the administration manipulated formulas to allow a small increase in the Medicare Advantage payments that were cut by the law. This avoided a firestorm among seniors who would otherwise lose their popular plans. But it means putting off the larger cuts that the law requires until after the presidential election. Secretary Sebelius has said she now realizes changes need to be made to the law’s long-term care program–another new entitlement which even the Democratic chairman of the Senate Budget Committee, Kent Conrad, called “a Ponzi scheme of the first order.” And in July, she testified before two House committees that the dreaded IPAB won’t be needed if Congress does its job in cutting Medicare payments to meet strict targets. Tactic number 3–attack Republicans–is in full gear. Sebelius said in congressional testimony recently that the Republican Medicare plan could cause people to “die sooner.” When challenged at a later hearing to defend the statement, she took the offense to criticize the Ryan Medicare plan. Clearly, it is imperative that conservatives prevent Sebelius and Obama from defining the issue on such distorted terms. It would be disastrous to allow the president to try to hide from his “signature achievement,” or distract the public by demonizing Paul Ryan and his Medicare plan. Our country’s future will be determined by what happens in 2012. The American people tried to tell Washington in every way they could that they strongly opposed Obamacare–from town hall meetings, marches on Washington, and electing Republicans to office in very blue states, to creation of an entirely new political movement. Washington didn’t listen. Now the White House hopes we will forget. That’s why it is so crucially important that Obamacare not slip to a second-tier issue in the political debate. The threats to our liberty, our economy, and our future prosperity could not be greater.